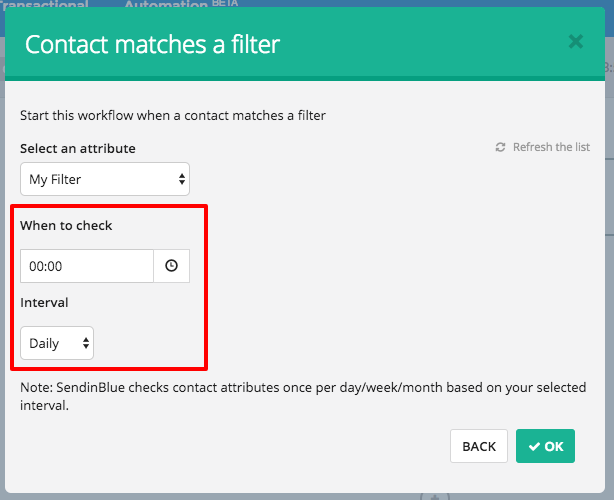 SendinBlue lets you launch a workflow based on contact attributes that match one of your previously saved filters (segments). To find out more about creating filters, you can read this article. 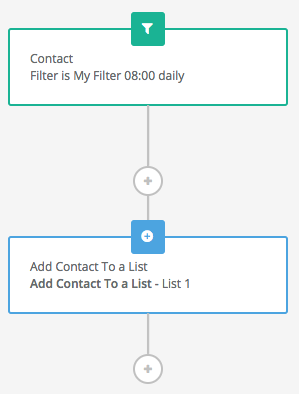 For example, you can create a filter for a particular target, such as a contact who is a customer on your website who has made their last purchase more than 30 days ago. Your filter would therefore be "Customer = Yes and last_purchase_date 30 or more days ago". All your contacts meeting this criterion would then enter the workflow. To create a workflow with an entry point that matches a saved filter, you need to create a custom workflow and then give it a name. Next, click on “Add an entry point” and select the type “Contact Details” and "Contact filter conditions". You can also add this entry point to a pre-existing workflow. 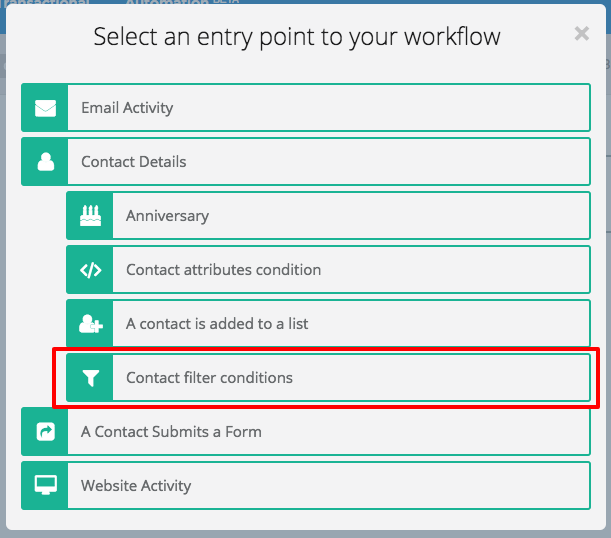 Select the filter the contact must match to enter the workflow. Then select the time at which the match should be checked and how often the check should be carried out. In the example shown below, the check is made every day at 00:00. 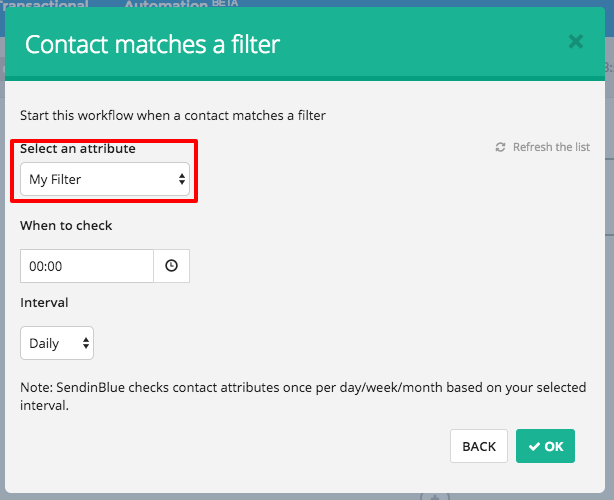 Once you’ve done this, add the action required when a contact matches the selected filter. 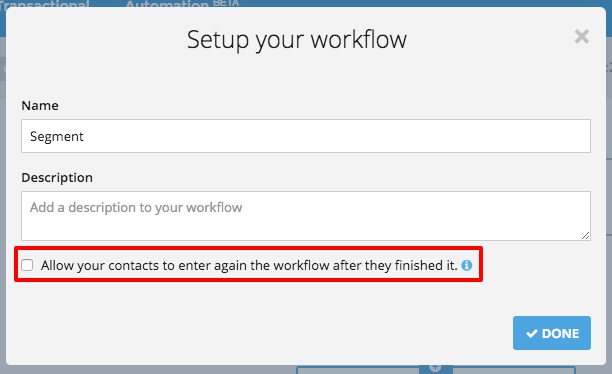 Note: so that the workflow functions in an optimal way, do not check the box "Allow contacts to enter this workflow again after they finished it".